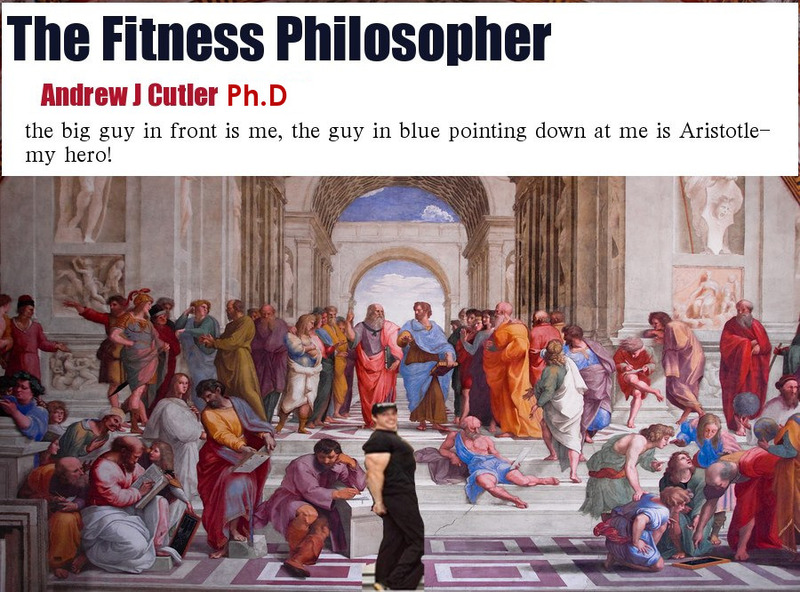 I first got into the 'philosophy of fitness' was when I was working on my MA Thesis in phenomenology and 'the philosophy of the body'. This lead me to thinkers like Heidegger who led me back to Aristotle and classical Greece and that is the area of philosophy I focus on these days. However, my appreciation for classical philosophy also includes the work of Epicurus and how the US Founding Fathers, such as Jefferson were really Epicureans and not Christians or neo-Platonists. Check out this amazing letter from Jefferson to John Adams! 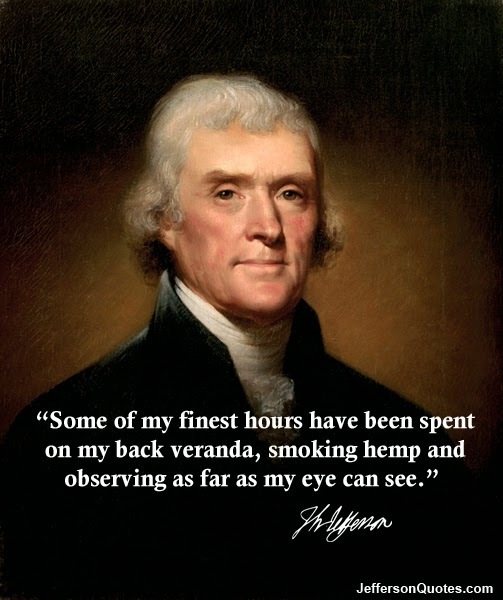 He was also eons ahead with his advocacy of hemp for both practical and theoretical uses! I am just returned from one of my long absences, having been at my other home for five weeks past. Having more leisure there than here for reading, I amused myself with reading seriously Plato’s Republic. I am wrong, however, in calling it amusement, for it was the heaviest task-work I ever went through. I had occasionally before taken up some of his other works, but scarcely ever had patience to go through a whole dialogue. While wading through the whimsies, the puerilities, and unintelligible jargon of this work, I laid it down often to ask myself how it could have been, that the world should have so long consented to give reputation to such nonsense as this? How the soi-disant Christian world, indeed, should have done it, is a piece of historical curiosity. But how could the Roman good sense do it? And particularly, how could Cicero bestow such eulogies on Plato! Although Cicero did not wield the dense logic of Demosthenes, yet he was able, learned, laborious, practised in the business of the world, and honest. He could not be the dupe of mere style, of which he was himself the first master in the world. With the moderns, I think, it is rather a matter of fashion and authority. Education is chiefly in the hands of persons who, from their profession, have an interest in the reputation and the dreams of Plato. They give the tone while at school, and few in their after years have occasion to revise their college opinions. But fashion and authority apart, and bringing Plato to the test of reason, take from him his sophisms, futilities and incomprehensibilities, and what remains? In truth, he is one of the race of genuine sophists, who has escaped the oblivion of his brethren, first, by the elegance of his diction, but chiefly, by the adoption and incorporation of his whimsies into the body of artificial Christianity. His foggy mind is forever presenting the semblances of objects which, half seen through a mist, can be defined neither in form nor dimensions. Yet this, which should have consigned him to early oblivion, really procured him immortality of fame and reverence. The Christian priesthood, finding the doctrines of Christ levelled to every understanding, and too plain to need explanation, saw in the mysticism of Plato, materials with which they might build up an artificial system, which might, from its indistinctness, admit everlasting controversy, give employment for their order, and introduce it to profit, power and pre-eminence. The doctrines which flowed from the lips of Jesus himself are within the comprehension of a child; but thousands of volumes have not yet explained the Platonisms engrafted on them; and for this obvious reason, that nonsense can never be explained. Their purposes, however, are answered. Plato is canonized; and it is now deemed as impious to question his merits as those of an Apostle of Jesus. He is peculiarly appealed to as an advocate of the immortality of the soul; and yet I will venture to say, that were there no better arguments than his in proof of it, not a man in the world would believe it. It is fortunate for us, that Platonic republicanism has not obtained the same favor as Platonic Christianity; or we should now have been all living, men, women and children, pell mell together, like beasts of the field or forest. Yet “Plato is a great philosopher,” said La Fontaine. But, says Fontenelle, “Do you find his ideas very clear?” “Oh no! he is of an obscurity impenetrable.” “Do you not find him full of contradictions?” “Certainly,” replied La Fontaine, “he is but a sophist.” Yet immediately after he exclaims again, “Oh, Plato was a great philosopher.” Socrates had reason, indeed, to complain of the misrepresentations of Plato; for in truth, his dialogues are libels on Socrates.